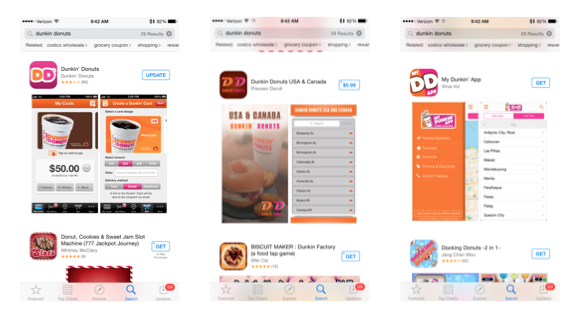 ← Want higher mobile conversions? Offer mobile-only promotions and 4 more tips. I just wanted a coffee but the Dunkin’ app stole my money. Update – Problem solved! Fix your damn app – and site! If you know me, you know that I’m mobile obsessed. For the past nine or ten years, I’ve been immersed in mobile. Mobile marketing, mobile websites, mobile apps, mobile devices. As a self-professed advocate, I’m constantly extolling the virtues of mobile. Apps, to me, are the greatest thing since sliced bread. They’ve got all the utility of a mobile site, without the need (for the most part) for an internet connection. Utility apps are my favorite. If I can get something done faster, in fewer steps, or using my phone in lieu of pulling out my wallet, or keys or ID, then it’s worth it. So when Dunkin’ Donuts came out with their Dunkin’ app, I was ecstatic. I’m always going to Dunkin’ Donuts or Starbucks. I blame the wife – a coffee whore (and I mean that in the kindest possible way) and the kids. I’m constantly making runs for egg and cheese croissants, donuts and coffee. I was parting with my cash regularly with no other perk than a free donut if I filled out their survey online – very analog. Dunkin’ Donuts perks were a big donut hole. Unlike Starbucks, whose loyalty program gave me free coffee, iTunes music and app downloads, discounts, coupons, the works. Starbucks treated me like they cared. But then one day I discovered the Dunkin’ app, and immediately set out to add it to my collection. Having previously used the Starbucks app, I figured the Dunkin’ app would be along the same lines. Download the app. Charge it up. Present it at the point of sale. Earn rewards. Get perks. For one, there are like three or four different apps in the app store (albeit by different developers – but you get my drift). Once you figure out which one you’re supposed to be using, it required an advanced degree in game theory to figure out exactly how to use it. All I wanted to do was put some money on the damn thing! Eventually, I was able to figure it all out, put money on my account and complete a transaction using their app. The sense of accomplishment was short lived, though. A few days after I got the app working, I upgraded my 64GB iPhone 6 Plus to the 128 GB version, and had to restore by new device from my iTunes backup, which essentially wiped all my stored passwords and forced me to log in to each one anew. By itself, that wasn’t so bad, since all my passwords are stored in 1Password and I simply had to cut and paste to get back up and running. That is, except for the Dunkin’ app. For some reason, it wouldn’t take my password. So I did what anyone faced with a similar scenario would do, I clicked “Forgot Password” fully expecting to walk through the fairly routine process of recovering or resetting my password. But that would have been too much like right. Instead of getting a confirmation screen telling me that my password (or instructions for resetting my password) had been sent to my email, I got a “We are currently experiencing technical difficulty and are unable to process your request” message. Confused by this seemingly ill-timed error message, I tried again – and got the same message. Technical difficulties processing a “forgot password” request? A horrible user experience at a critical moment. Oh, did I mention that I was standing at the register of Dunkin’ Donuts, with several frustrated customers behind me watching me fumble with the app? My frustration was all the more palpable because (prior to swapping devices) I had loaded my account with $25, which I could not use. Flustered, I pulled out my bank card and swiped – angrily – snatched my order from the counter (which I no longer wanted) and stomped away in a huff. For the next few days, I repeatedly tried to log in – unsuccessfully, before relenting and visiting the Dunkin’ Donuts website. And you know what happened when I got there? The same damn thing that happened on the app! Really? So you’re planning on fixing this when? On your site? Technical difficulties on your site? Is sending an email with password recovery instructions a technically challenging activity? 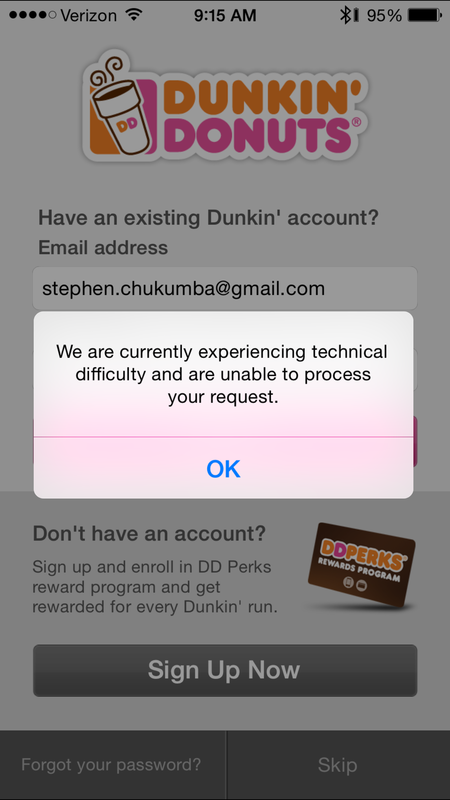 Dunkin’ Donuts is stealing my money by preventing me from accessing my account and make purchases using the funds I’ve uploaded to the Dunkin’ app. Their “technical difficulties” are subterfuge allowing them to hold my monies hostage and force me to use my bank card depriving me of precious points, perks or rewards. Dunkin’ Donuts, get your act together. Or give me back my money. The Starbucks app still works and I need to reload. Note: Prior to penning this post, I sent Dunkin’ Donuts an email on their site, an email from the app, and tweet asking for assistance. As of this posting they have been radio silent. Update 2/12/15: Dunkin’ Donuts’ customer service send me a response giving me the steps to recover my password, which I had already done – and was still broken. Update 2/27/15: Problem solved! After waiting on hold for an hour to speak to a customer service representative, we determined that I had registered with “.con” at the end of my email address, instead of “.com.” I told the rep who helped me that the more appropriate error message to keying in an incorrect email address should have been something like “The email address you have provided is not in our records. Please check the address and try again.” and not “Sorry, we are currently experiencing technical difficulty and are unable to process your request.” With the error message DD provided, one would never realize that they may have made an error keying in their email address, as I did. I was having the exact same issue. I couldn’t get into my account or get the password reset. I just tried it with .con and that’s what it was. You’re a lifesaver as I didn’t want to wait on hold for hours. Aaron, I’m glad that this post was useful! Even though this is an old post, thank God you wrote it. I just experienced this when getting a new phone and using the backup. Wtf?? The app also wouldn’t work for me blah blah blah said I had no points and no money (and like you, I had just uploaded money to the damn thing). Tried your “.con” email issue and PRAISE JESUS that was fixed it. Coincidence or is Dunkin’ cleverly screwing people to snag some extra $$? Either way, you’re a saint for writing this and helping me solve this issue. I purposely leave extra money on my DD card….lately I used the app and my balance is always zero….obviously it’s hacked and I keep losing the extra money on the card. The perks and the points are not worth the loss. Now the app is asking for bank info! 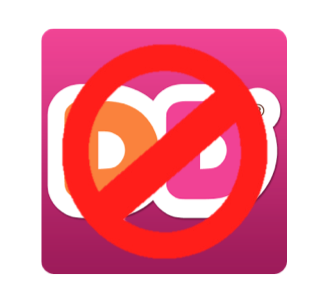 Dunkin get your act together and provide a safe app. I won’t be using it again. I lost my money when I updated the app. It’s 2016 and they still have glitches like that? For shame! If you think the app is a pain in the but don’t try the new, On The Go, feature. I work at a Dunkin and the stupid preordering app doesn’t work. So everyday I get at least 5 customers bitching at me because they placed an on the go order and it’s not only not ready but we never got the print out on our machine to inform us. Having a problem with app and it tells me there is a security issue and i have $49 on it and i can’t seem to get through to customer service. this makes me sick. What are you supposed to do to get things resolved when no one talks anymore!!!! One thing you have to consider is that websites typically won’t let you know if you are using a wrong email address for security reasons (i.e. someone trying to hack your account and using different variations of email addresses). More often than not, companies that tend to protect your info would only state that if your email is correct, you will get a message in your inbox. Tarugo, I’m going to have to respectfully disagree with you. Perhaps some site engage in the practice, but best practice dictates that you give users the specific reason why or highlight where the attempted transaction failed so that the user knows what steps to take to correct their error. A generic “technical difficulties” message is not only terribly misleading, it serves no particular end for either the user or the brand. Can anyone tell me the correct dd app to download? Tried one and when I try to register at the end all I get is we are having technical difficulties with our system sys101 any advice? Thanks! I’m having an issue as well. I put $$ on a card and when I entered my email address, I was told that I already had an account. By that time, I checked my email as I was directed to do and found that the $$ was put on card ending in XXXX. However, I never had a DD card!! I called customer support (I use the term loosely) and for the first 3 calls was told the systems were down!! My 4th call, I waited 33 minutes and no one answered. The 5th call, I was told would take no longer than 15 minutes, so 20 minutes later, I hung up. All I want is for them to give me the remainder of my number so I can register the card! Barb, you’re just going to have to try, try and try again until you get a live operator. I took a two fold approach and sent emails and called every day until it was resolved. It was a hassle, but in the end, it was fixed. Good luck! I’m having the exact same issue when I switched iPhone’s. I didn’t mistakenly input .con so I’m assuming with 99% accuracy what they told you was bull. Guess I’ll call & sit on hold for 90 min tomorrow in hopes they’ll figure it out on my account. Yeah. It was quite the ordeal getting them to respond. Luckily the issue was with that data input. They should have you input your email and/or password twice to confirm that you’ve entered it correctly, as this is clearly not an isolated or one-off issue. Good luck though!